re-themed Dragon challenge will be replaced by a new Coaster..
•This all-new thrill ride will take you deeper into J.K. Rowling’s Wizarding World, where you will encounter some of your favorite characters and creatures. It’ll be unlike anything we’ve ever done before and it will be fun for the entire family. •The new attraction will be one of the most highly-themed coaster experiences we’ve created. It will combine a new level of storytelling with an action-packed adventure…and a few surprises along the way. •Our award-winning Universal Creative team is once again collaborating with Warner Bros. and the production design team from the Harry Potter films to bring this new coaster experience to life. •This ride is going to redefine the category and transport you to thrilling places, drawing you into even more exciting adventures within the wizarding world. It’s going to be the perfect addition to Hogsmeade. We’re permanently closing Dragon Challenge on September 5 to make way for this all-new ride. The last day of operation will be Monday, September 4. Stay tuned to the blog or sign up for email updates – more details will be released in the future. In the meantime, make sure you come out and take your last ride on Dragon Challenge before it closes. Really bummed they're closing Dragon Challenge in September. I was hoping to grab one last ride on our trip in October, knowing that the end was near for the coasters. I'm pretty shocked that Universal is going head-on into Star Wars. Perhaps the earlier than expected closure of Dragon Challenge is so Universal can get moving and finish this new Potter attractions before Galaxy's Edge opens at DHS. 2019 is shaping up to be quite a year in Orlando. I'm glad we delayed our every 2-years trip to Orlando last year to this year, so we're perfectly on schedule to get the maximum number of new attractions on our next trip, and then again in 2021 for WDW-50. Fantastic news. Love everything Universal is doing with the Harry Potter franchise. I was a little worried they were going to try to tie new attractions or rides to Fantastic Beasts so I'm elated to see they're continuing to improve the existing Potter lands. I am hoping they use Bolliger & Mabillard for the new ride. As you know, they make great coasters and this is one their designs. The old Fire and Ice opened in 1999 so I am excited for a change. I wonder if Universal sell's this coaster or just scraps it? I'm calling it now, they are buying an SFX coaster from dynamic attractions. As for Fire and Ice they were my first "big boy" coasters and I'll be sad to see them go. I hope Universal sells them to another park or split them up (see Great Adventure Lighting Loops). This may be the first time a B&M coaster gets scrapped. The Dragons are amazing coasters, but complete shells of themselves after Universal stopped them from "dueling". It would be great to see these pop up somewhere else in the world, but I doubt any park would be willing to buy both. Heck, if I had the license to Game of Thrones, I'd buy these in a second and get B&M to design a 3rd coaster to interact with the existing 2. @Cole - This post doesn't say anything about the new attraction not being tied to Fantastic Beasts, and seeing as no one knows where the sequels are going (Rowling is writing the scripts from scratch, not existing texts), there's no way to be sure Scamander doesn't somehow end up in Hogsmeade. @Jaiden - An SFX coaster does sound like a good match, but Universal was very specific in stating it would be for the "entire family", so any layout with inversions might be a non-starter if they're looking to appeal to the whole family. Also, I'm not sure how much an SFX design would differ from Gringott's and/or Mummy, since they're calling this unlike anything they've done before. Considering they want to open this in essentially 18-20 months, it would have to be a relatively simple build or be predominantly outside, since it would take some serious time to build a coaster, put a building around it, and then put all of the theming elements in place. Gringott's took over 2 years to build and did not include the time tearing down Jaws, though much of that time could be attributable to the entire Diagon Alley construction. 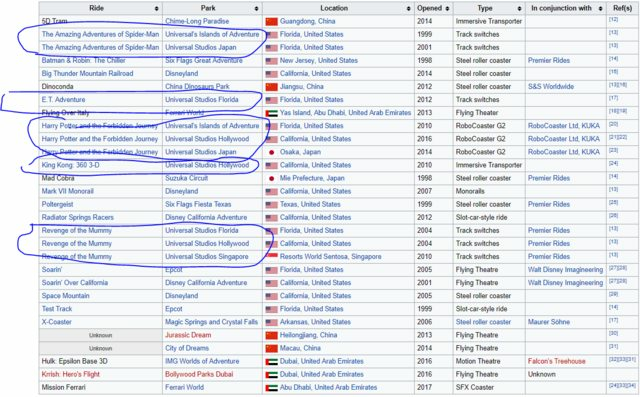 Assuming they can get the dragons down by November/December, they'd have a serious tight timeline to get a "major" attraction in place by the start of summer 2019. Also, Dragon Challenge would indeed be the first B&M scrapped (unless you consider the original Hulk as being scrapped) if it did not get resurrected somewhere else. There's a BTR in Kuwait that's SBNO, but every other installation is either running or has been moved to another park. I would say it's a bit disappointing that Universal may be rushing this attraction to go toe to toe with Star Wars, instead of building a new themed land around the Forbidden Forest on the Dragons site and nearby backstage area, as had been rumored over the past few months. However, a Ministry of Magic land next to Diagon Alley may still happen one day, though probably after Nintendo land. @Russell, I do like the idea of a ministry of magic themed ride in place of the Fear Factor area. I think WWoHP is a bit old already. The franchise is already 22 years old and does not have the appeal of Disney Princess or Star Wars. I think Universal need to forget WWoHP (come on, the glory days of 2010 were a long time ago now) and stop living on former glories. FACT: EVERY AREA of IOA is in need of a refit more than WWoHP. Yet Universal think a bike and sidecar coaster themed to Hagrid in the Forbidden Forest will take some of the shine away from Galaxy's Edge. I am really am lost for words. Jaidan - I went to the site for SFX coaster from dynamic attractions - That looks pretty great..
Clackers = *Yawn - You do not want Universal to use the past glory days, but you like Disney's Princess and Star Wars? Aren't those two like 40 years old stories? And the Demise of Universal thread no one agreed with. Clackers, mind revealing how you know this is going to be a bike and sidecar coaster? I don't see anything about that in the press release. Plus Dynamic said they sold a SFX coaster to an American company.